Fredericksburg High School senior Gloria Burns (center) receives the SystemsGo Brett Williams Scholarship, presented by Rebekah Hyatt, Program Director, and Scott Netherland, Executive Director. With her are her parents George Burns (left) and Katie Burns (right). 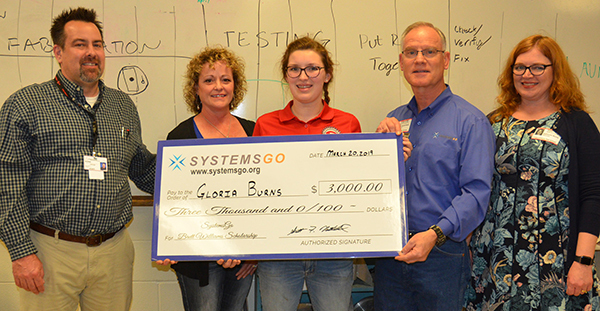 Mar 29, 2019–The Board of Directors of SystemsGo has announced Gloria Burns of Fredericksburg High School as the 2019 recipient of the SystemsGo Brett Williams Scholarship in the amount of $3000. Gloria Burns is the daughter of George and Katie Burns, and is a senior at Fredericksburg High School. She has completed all four years of SystemsGo, a Science, Technology, Engineering, and Math (STEM) curriculum that develops 21st century workforce skills. She has worked on teams building rockets that sent a one-pound payload to transonic speed, and this year is Chief Engineer for the student team designing and building a rocket to achieve 80,000-100,000 feet launching at the Army’s White Sands Missile Range in June. Her teacher is Andrew Matthes. The annual scholarship was established in 2017 by the SystemsGo Board of Directors to sustain the legacy of SystemsGo founding instructor, Brett Williams. Each year it is awarded to a qualifying high school senior. One candidate from each school may apply. They must have a Teacher Endorsement, have successfully completed the Tsiolkovsky level of the SystemsGo curriculum, and submit an essay describing the impact the program has had. The winner is selected via anonymous review by a scholarship committee of SystemsGo board members. The deadline for submitting the application is January 15. Information is available from SystemsGo teachers or by calling (830) 997-3567.